“The Palms Villa” is a modern 3 bedroom luxury villa directly on the Indian Ocean. The golden sandy beach is just a few steps from your front door. The beach is clean, wide and secluded. Any time of day you most likely will be the only one on this beautiful beach. The views of the beautiful blue ocean are just magnificent. Sri Lanka has been called the “Pearl of the Indian Ocean”, for good reason, this is a beautiful island paradise. The spacious villa has a modern large open floor plan. Fantastic exotic wood work throughout. Folding glass doors across the front of the villa lead you out to a wide shaded patio equipped with ceiling fans in addition to the cooling effects of the ocean, truly seamless indoor/outdoor living, you are guaranteed to be comfortable sitting here enjoying this picturesque view. 'The Palms Villa' can accommodate a party of up to 6 people in 3 bedrooms. We provide bed linen and towels and can supply a cot, as well, if necessary. Wi-Fi internet access is available throughout the beach house. I've owned and rented over 15 properties for more than 20 years. I know people want timely responses to their questions and concerns. 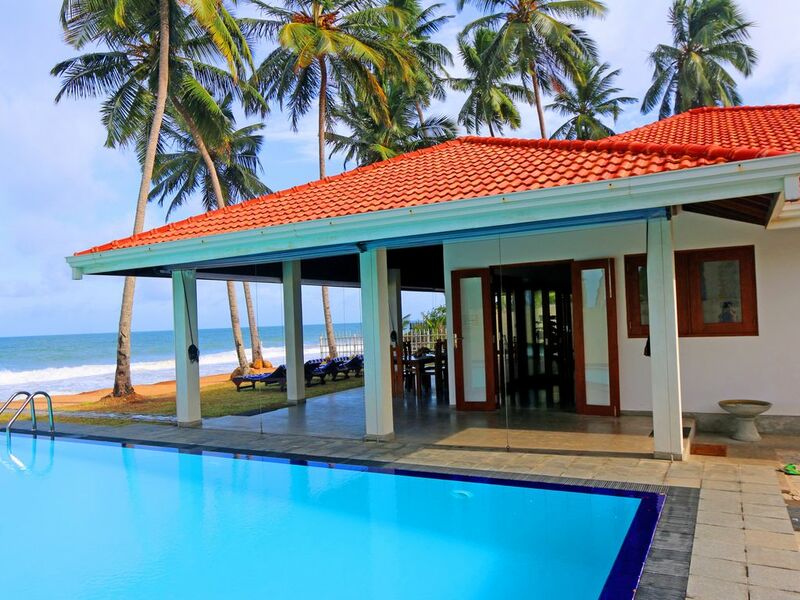 We have a property manager in Sri Lanka that is currently managing several properties very close by. All his reviews are 4+ stars. He speaks English fluently in addition to Sinhala, Finnish, Italian and German. This villa was designed for the discerning traveller, exotic hardwoods, single level, high ceilings, air conditioning, large and fully equipmed kitchen, large pool, many luxury amenities, 24 hour professional security, full time caretaker and additional staff available if requested. Sitting on your private patio watching the sun set is truly mesmerizing . Additional amenities include: Large private swimming pool, private garden, beach towels, linens, 3 air conditioned bedrooms, ensuite bathrooms, safe, beach and pool chairs, patio deck, 3 custom made queen beds (7 feet long), all of which can be separated into 6 twins, local professional and experienced management, Professional 24 hour security, full time caretaker / pool man. Menu available for meal delivery. Cook, housekeeping and other services available upon request. We are here to make this your best vacation. 100%...we will return! We LOVED our stay!! We stayed in this villa for one week with our three children (ages 3,9,&12). We could have not asked for a better week. We came to Sri Lanka to completely relax and that is what we did. The staff was super helpful and non obtrusive at all. They were always smiling and willing to help. Any problems we had were address with Udith and they were taken care of promptly. We cooked most of our food the entire week and the fully stocked kitchen was a big help with that. We shopped at Food City (tuk tuk 300-400 rupees up and down) for our groceries and that was very easy to access. The ocean was a little too rough to swim in but my kids were more than happy with the pool. We did venture out two different afternoons. One day we did the moonstone mine, the river safari, spice garden, and the turtle hatchery, which our entire family enjoyed. The other day we went to Galle Fort for some souvenir shopping and dinner and that was fun as well. All in All...it was WELL WORTH the 5 stars that we have given this place. It was certainly a pleasure having you as our guest and thank you for that five star review. We are looking forward to having you back soon. Villa is gorgeous. Its spacious & clean. It is right on the road, which is noisy. If you don't have the beachfront bedroom, you will need earplugs! The villa is safe for children, as it is enclosed. We used tuk tuks to get to hikkaduwa to eat in the evenings, which was great, there is plenty of choice there. The food at 6 degrees is lovely, but I would suggest getting a bill for each meal as you go, so you are not surprised by the amount. Dinner from six degrees served at the villa was expensive we thought. 75 us dollars for 2 fish, with rice and salad. The bill for that actually came to 96 us dollars with local taxes. That was not worth the money! Overall the holiday experience was 5 star as the villa and the staff were so lovely. Thank you so much for that 5 Star rating. We enjoyed having you stay at our villa. The villa was built less than 4 years ago and designed to mitigate any sounds from the road, with a high walls, tile roof, heavy steel roll up driveway door, and heavy duty windows where necessary. To put your comment in perspective we have had over 150 guests, only two have mentioned the sounds from the road as a minor inconvenience. However we are determined to make all our guests 100 percent happy. We have hired an acoustical engineer to improve our current design to better mitigate the sound from the road. Concerning the meals delivered to the villa, this is similar to room service, we do not charge extra (15 to 25 percent) for this service as a hotel would. Your meal was two whole expensive fish, cooked and prepared just for you, delivered to villa. We feel our meal prices are in line with the other villas. Thank you so much for that 5 star review. We certainly enjoyed having you and hope that you will return soon to our villa. amazing host with udith and really nice staff the house is soooo comfy right on the beach can't wait for another visit!! Thank you so much for taking time out of your busy schedule to write that fantastic 5 star review. We are happy to hear you had a great time and are looking forward to having back again soon. A perfect spot for a family vacation! We had a fabulous time at the Palms Villa. I visited with my mom and four kids (ages 11-15) for a full week. It was a return trip for us to Sri Lanka but our first time on the southwest coast. The villa is beautiful and well equipped with beach towels and enough kitchen supplies to cook for ourselves. The ocean was definitely swimmable at this time of year (April). My older three swam everyday in the surf, but we are a family used to managing waves. It is not a calm beach for very young children, but my 11 year old who is a bit wave-shy still loved running in and out of the waves. The pool was perfect to balance out the exciting surf. We liked that we were away from the craziness of hikkaduwa but that we could get there easily for a couple of days of surfing and shopping (we walked up the hill from Hikkaduwa to Sakura Batik and met the lovely couple who run it - we bought beautiful batiks there). We highly recommend taking the bus as it was easy and cheap. There is a bus stop just across the street and to the south a bit. Coming back we sometimes had to wait until the Ambalangoda stop in town, but then it was a nice walk along the beach or a quick tuk-tuk back to the villa. We also highly recommend taking the train into Galle as it again was easy and so much cheaper than hiring a driver. Plus it's a beautiful train ride. We did have Udith arrange a driver for us to Mirissa to see blue whales and that was a fabulous day! We went with Raja and the Whales and can't recommend them enough. They cost more, yes, but they were so much better than the other companies we saw on the water. They were respectful of the whales and the environment, they recycle, provided breakfast on real plates to reduce waste and were so knowledgeable about the whales. Other companies were loud and obnoxious rather than quiet observers of the amazing nature they were seeing. We balanced out cooking for ourselves with eating out and ordering from 6 Degrees North a few villas down. Their food was amazing and would always provide leftovers. We went each morning to a small store across the street and a few hundred yards up the road to the left to get fresh bread, water and whatever other goody they had - our favorite was a crepe wrapped up with coconut and honey! The guards and the young man who cleaned for us were lovely and much appreciated. We would definitely return again to the Palms Villa! Thank you for that complete and comprehensive review. We are thrilled that you and your family enjoyed your vacation and "The Palms Villa" so much. And thank you for those great tour recommendations, I'm sure future guests will appreciate all the time and effort you have put into this review. We visited The Palms villa two families with 2 young boys. Villa is very fresh, good quality and very well kept. Everything we saw in photos was exactly the same when we arrived. Absolutely distant from other world, just enjoying incredible views, rough ocean and hospitality of Udi, Siva and the the Team. The Chef working in resort near by (Nine degrees North) and has the same management was really great. We visited couple of restaurants in Hihhaduwa, but local food was far better. We had the best vacation for last couple of years for sure. Santa......Thank you for that great 5 star review. We really enjoyed having you and your family at our villa and are looking forward to having you as our guest again. Everything needed is within walking distance or just a short/ inexpensive Tuk Tuk ride away. A full service Sri Lankan restaurant is across the street, a small convenience store is just a 5 minute walk. A fully stocked grocery store a 10 minute Tuk Tuk ride (USD $5 round trip including tip). There are many buses which go to Ambalangoda, Galle and Hikkaduwa on Galle Road. Sri Lanka, officially the Democratic Socialist Republic of Sri Lanka, is an island country in the northern Indian Ocean off the southeast coast of the Indian subcontinent in South Asia. Known until 1972 as Ceylon, Sri Lanka has maritime borders with India to the northwest and the Maldives to the southwest. The island consists mostly of flat to rolling coastal plains, with mountains rising in the south-central part. The climate is tropical and warm, due to the moderating effects of ocean winds. . Average yearly temperature ranges from 28 °C (82.4 °F) to nearly 31 °C (87.8 °F). Day and night temperatures may vary by 14 °C (25.2 °F) to 18 °C (32.4 °F). Activities include swimming, snorkeling, scuba diving, windsurfing, sailing, fishing, stand up paddling and kayaking. Nearby Ambalangoda is well known throughout asia for its dancers and carved masks that you can purchase at the museum or the local mask stores. In the Hikkaduwa and Ambalangoda area there are many interesting day trips including the UNESCO World Heritage Site of Galle Fort which is located just 30 km south of the villa, not only for the history and old churches, but for the fantastic shopping. Also nearby is many temples, the turtle hatchery, moonstone mines, cinnamon farms, several well stocked antique stores, lake tours. World famous architech Geoffrey Bawa's Lununganga and letter-Garden are highly recommended. We offer transportation services including transport for the airports and multi-day tours in our air-conditioned minibuses or car with English speaking drivers, which can be scheduled at any time. There are many well known UNESCO World Heritage sites, national parks, tea plantations, temples, Botanical Garden, Elephant Orphanage, waterfalls, hanging bridges, and whale watching. Although this is a self catering villa, we provide at an additional charge many services, including chef, full time housekeeper, transportation, massages, groceries and any other services you may want.